Danelectro is a fun brand of guitar effects. Original enclosure designs look very pleasing and many of the designs they house are good. There are Danelectro designs with obvious faults too. The design “errors” make up a part of why i find these effects interesting. 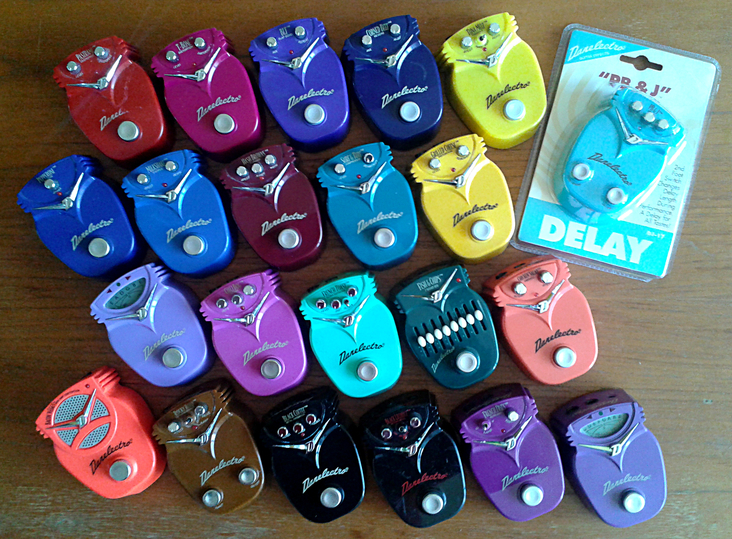 The classic Danelectro series of big metal housed pedals that were first introduced to the public in 1996. 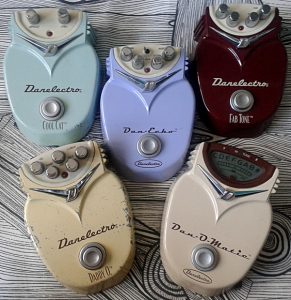 Addition to Original series, Danelectro produced two separate, smaller series of pedals with the same basic enclosure as the Original series. The 60’s serie boxes are decorated in hippie style, while Paisley boxes offer visual candy of paisley patterns. Don’t know what to call these units that are related to Original series, but are completely different. There are three different plastic rocker pedals and two wide tabletop-style units for reverb and tape echo simulation. Danelectro’s spinoff brand was called Wasabi. Special style enclosure and quite interesting designs in them. The Cool Cat series was introduced in 2008 and it offered small metal cased effects with 3PDT true bypass switching, which was all the rage at the time.. The Mini pedal series was introduced in 1999 and it has a wide selection of classic and modern sounds in affordable plastic housings. Entries (RSS) and Comments (RSS). 30 queries in 0.099 seconds.